May | 2014 | Buen provecho...2018! Unlike in Canada, we tend to eat a lot of fish here, probably because it is so plentiful. Our favourite is, of course, Pacific salmon when we can get it, but we also enjoy many other fish fresh from the Gulf! Mostly, we purchase white fish, which has a variety of types, more common are grouper, bass, pompano and red snapper in our area. White fish is especially low in fat. White fish is rich in B vitamins. White fish is rich in selenium. White fish is a great source of iodine. White fish is high in protein. Farm-bred fish have been found to have high concentrations of antibiotics and pesticides – Where do farm-bred fish get their antibiotics? The crowded conditions of fish farms cause the fish to be more susceptible to disease. To keep them alive, farm owners give antibiotics to the fish to stave off disease. Farm-bred fish are also treated with pesticides to combat sea lice.2 The pesticides used to treat these fish are so deadly that they have been caused to kill wild salmon that are accidentally exposed to them. These pesticides are also eventually released in the ocean where they get into the bodies and systems of other marine life. This recipe is not only easy to prepare, it is very tasty and looks so great on a plate. Food Network to the rescue with this one! I hope the preamble does not put you off! Read labels!!! Ask questions. 1/2 dozen baby peppers in a variety of colours tops only removed – (Costco sells these by the bag here). In a 9 by 13-inch baking pan, combine tomatoes, peppers, oil, garlic, salt, pepper and 1/2 the basil. Roast for 15 minutes. Remove from oven, gently stir. Nestle fish in pan with tomatoes and peppers, place back in oven and continue roasting 7 to 10 minutes more or until fish is no longer translucent and tomatoes are just beginning to burst. Remove from oven. Divide fish among serving plates. Add remaining basil to tomatoes. Taste and adjust seasonings. Spoon over fish in equal portions. Most of you know that Larry loves to experiment in the kitchen, while I am strictly a cookbook cook! 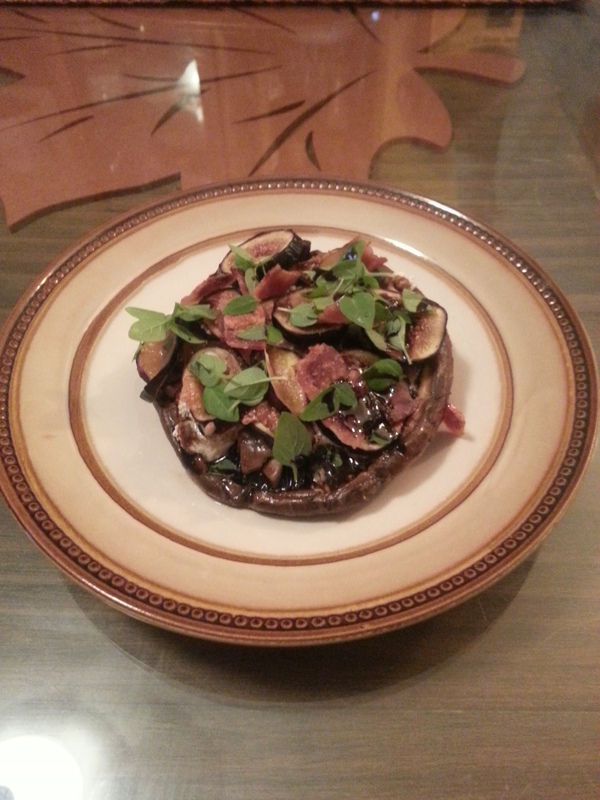 A friend shared her portobellos with us the other night. “What’s for dinner?”, he asked. “How about basil and prosciutto pizza with goat cheese?” I replied. “Go for it!” I replied. Et voila, here is the result complete with a pic so you can see how great it looked. BTW…it was fantastic!!! Soften the goat cheese so it is spreadable. Prepare a ribbed grill pan, brush it with olive oil and place over medium heat. Remove stem from mushrooms, chop it finely and set aside. Brush both sides of the mushrooms liberally with olive oil. Cut bacon into one inch pieces onto a doubled sheet of paper towel and microwave one minute. Set aside. Into a small fry pan, put a Tbsp. of olive oil and put over medium heat. Add the chopped mushroom stems and the garlic and fry for about 3 minutes. Turn off heat. Place the sliced figs in a single layer in a pan large enough to accommodate them. Sprinkle water, one tablespoon at a time, enough so that the slices won’t stick to the pan and simmer them just long enough to soften the slices. Turn off heat and let sit until needed. Place the mushrooms topside up on the grill and grill for about 5 minutes. Transfer mushrooms to a microwavable plate and microwave on high for one minute. Transfer back to the grill, topside down this time. Cover the surface of each mushroom with a generous coating of cheese, place the chopped mushroom mixture, then the slices of fig over the cheese. Then add the bacon bits, and finally the basil pieces. Sprinkle sparingly with Chinese 5 Spice powder. Drizzle with balsamic glaze. By this time the mushrooms should be cooked through….soft but not mushy. Plate and serve.